Good evening, readers! I have a rainbow manicure today to share with you for the 13 Days of January challenge! 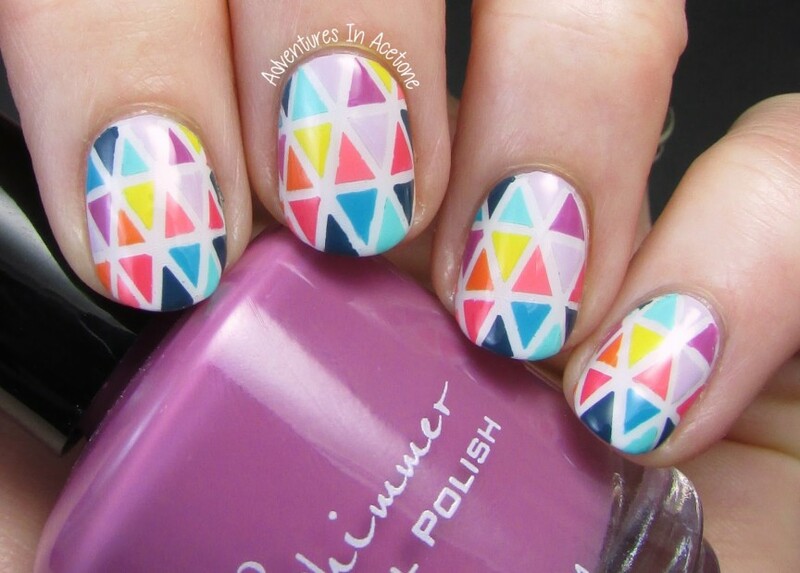 This geometric design is currently my phone wallpaper from Erin Condren and I knew I wanted to try nail art inspired by it. With so many fun colors, the Rainbow prompt was the perfect time! I used striping tape and 10 creme polishes to create this look. I started out with 2 coats of OPI My Boyfriend Scales Walls and let dry. I added one coat of quick dry top coat to speed up this process before moving on. Once the base was dry for a while, I used about 10 pieces of striping tape on each nail. I started out with diagonal in one direction, then diagonal in the opposite crossing over, and finally the horizontal pieces cutting the diamonds into triangles. I used a dotting tool and filled in the triangles to mimic the wallpaper using these 9 colors: OPI In My Back Pocket, OPI Rumple’s Wiggin’, OPI Good Grief!, OPI Sorry I’m Fizzy Today, China Glaze Too Yacht To Handle, Barry M Guava, KBShimmer Let’s Not Coral, KBShimmer Stonewashed, and KBShimmer Radiant Orchid(bottle shown). I then peeled off the tape layer by layer until I had triangles on a white base. I sealed the design in with 2 coats of KBShimmer Clearly On Top. Here’s a bonus shot with my phone so you can see my inspiration! This took like 2 hours for a full mani but it was so worth it, I never want to take it off! What do you think? Thanks so much for reading! Check out what the other ladies did below! These are incredible!! I love all of those colors together! Dang! This is gorgeous! Wow! Wow, this is awesome. What a fantastic idea. Thanks for sharing and for being such an inspirattion to newbies like me and others.